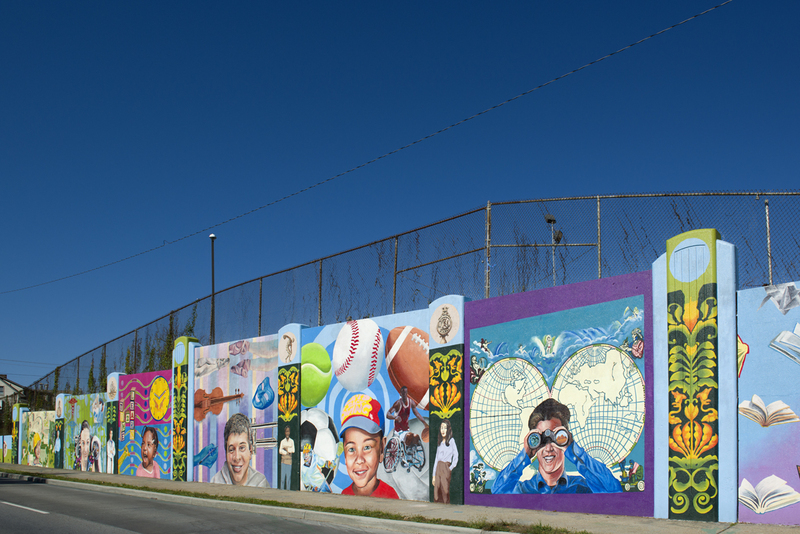 The original Wall of Education, designed and painted in the late 1970s by Joyce Young, Gilbert Young and a team of students, was a vivid and colorful mural celebrating the lives and talents of Cincinnati’s diverse youth and disciplines of education. This updated Wall of Education honors that legacy with vibrant images of actual Cincinnati students engaged in 21st century pursuits of learning. “Guardians” have also been painted at intervals along the wall to show the importance of adults supporting children throughout their educational and personal development. In partnership with ProKids and Cincinnati Public Schools.